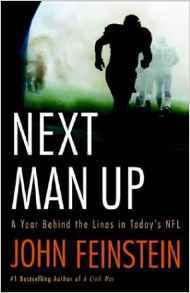 Last night I finished reading Next Man Up: A Year Behind the Lines in Today’s NFL, by John Feinstein. It took me well over a month to get through this 400+ page epic covering the 2004 Baltimore Ravens season. Regardless of how hard I tried, I just couldn’t get into it. I am a huge football fan, so that should tell you something. I very much enjoyed Feinstein’s 1996 football work, the incredibly long-titled A Civil War: Army Vs. Navy : A Year Inside College Football’s Purest Rivalry, so that should tell you something as well. It’s not that “Next Man Up” isn’t interesting. It’s actually quite fascinating. It’s just that it’s not so much a “book” as it is a journal. Feinstein includes every single boring and minute detail of the entire season, and, man, there are a lot of not-very-dramatic things which happen in a year in the NFL. I don’t know if he felt — or was — hamstrung by the league or the team to not include anything really juicy. But believe me: There’s nothing juicy there. Or, better, anything that was juicy became last-week’s leftover office doughnuts bland after he got done writing about it. The names! There are so many names. The equipment manager’s name. The equipment manager’s high school coaches’ names. The equipment manager’s high school coaches’ wives’ names. It seemed like for some unknown and incomprehensible reason the author decided to include the name of everyone ever associated with anyone ever associated with — or related to — anyone working for the Ravens or any of the other 29 teams in the league which may or may not have played the Ravens in 2004. Parts of the book reminded me of the beginning of the Bible with the hundreds of begats that make your eyes bleed when you read it. And I love football! This is a book that only a die-hard Ravens fan could love. And then only if it’s a die-hard Ravens fan with a burning thirst for encyclopedic knowledge of the completely uninteresting front office personnel of the team.